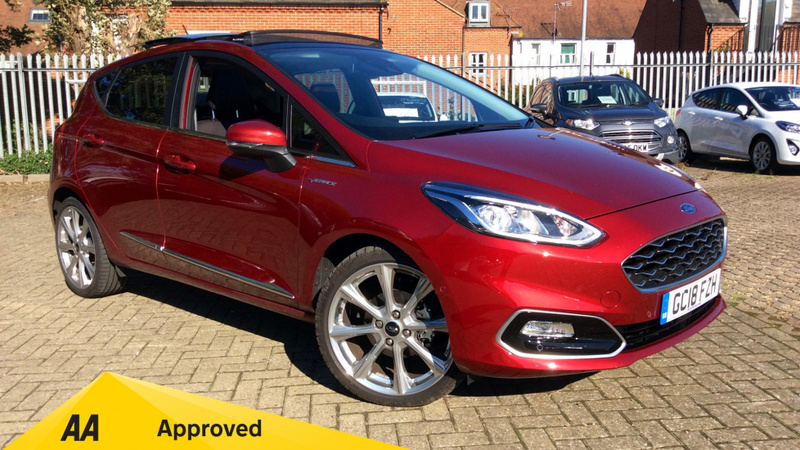 Our Fiesta Vignale is looks great in the exclusive Ruby Red paintwork! Ford's Fiesta has always been a key model in the supermini sector but the latest seventh generation model is aiming to put rivals well and truly in the shade. June Neary takes a look. You must have heard of Ford's Fiesta. Women like me and family people up and down the country depend on it. It's been right up amongst the most popular small cars in the UK ever since the launch of the original version way back in 1976 (yes, it was that long ago). Needless to say, Ford's finest has changed massively down the years but rarely, if ever, has the model line made as significant a step forward as the one that Ford say has taken place with the current seventh generation model which now has segment leading technology and further develops Ford's clever three cylinder EcoBoost engine range. Today's Fiesta is a massively important car for Ford and nothing has been left to chance in ensuring it hits the spot with its target market. As target markets go, the Fiesta's is a massive one. This is a small car that needs to appeal across the board to people from all sections of society. First impressions are that it stands a good chance of pulling this off. The car uses the Kinetic design features that have cropped up to critical acclaim across the Ford model range but to you and me, it just looks angular, sporty and well planted on the road. Looking good is half the battle in the supermini sector and the Fiesta certainly manages to do that. The outside look has merely evolved but I still like it. As before, it's offered in both three and five-door bodystyles and both are tidy pieces of styling with evolutionary styling and a bolder, wider front grille. The side profile is more settled and less wedge-shaped, combining with 71mm of additional body length and 12mm of additional width to give what Ford hopes is a longer and more premium appearance. Inside, the old button-heavy fascia with its cheap plastics that I used to hate has gone. In fact, the number of buttons on the centre console has been reduced by almost half, with many connectivity and entertainment controls relocated to a freshly developed 'SYNC3' 8-inch touchscreen. My passengers were pleased to find that rear seat folk now benefit from 16mm more knee room, supported by new slim-back seats that are softer, and offer greater side-to-side support. This Fiesta's tailgate is wider for easier access to the boot, and improved storage for personal belongings is delivered with a 20% larger glovebox and a 1-litre media bin in the centre console. The windows are small and set high up, so light isn't abundant in the back which might trouble some kids but the shopping bags, coats and road atlases that owners will store there most of the time won't be overly worried. The five door models fare better with a bigger glass area creating a roomier feel and all derivatives share the same easily navigable control system for their various electronic functions. General build quality is a real eye-opener. The Fiesta feels like a far more sophisticated and grown-up car than the models which preceded it and a lot of this is down to the all-round quality of the materials, as well as the solidity with which they knit together. Despite the fact that it's lighter than previous generation models, today's Fiesta manages to feel larger and more solid on the road - an impressive achievement by Ford's engineers. This new generation model is 15% stiffer and both front and rear track measurements are wider. The engineers tell me that the chassis now offers 10% more cornering grip, supported by Electronic Torque Vectoring Control, which enhances the driving experience by applying a small amount of braking to inside wheels to assist traction and stability when cornering. Braking distances at 62mph are reduced by more than 8%. There are freshly developed five and six-speed manual gearboxes. And rear disc brakes feature on models with engines developing more than 100PS. Ah yes, engines: you'll want to know about those. The three cylinder 1.0-litre EcoBoost petrol unit is carried over from before, offered in 110, 125 and 140PS guises. Sharing this poweplant's architecture is a lesser 1.1-litre normally aspirated unit, available at the foot of the range in 70 and 85PS forms. The 1.5-litre TDCi 85PS diesel unit is familiar from before too, but this time round, this powerplant is also being offered in a pokier 120PS guise. Like most superminis, this Fiesta sells in the £13,000 to £18,000 bracket - and there's a small premium if you want to progress from the three-door to the five-door bodystyle. Most private customers will buy in at the mid-range 'Zetec' level that starts at just under £15,000. Beyond that, there are 'Titanium', 'Titanium X', 'ST-Line', 'ST-Line X' and 'Vignale' specification options. Plus 'Zetec' and 'Titanium' models can be ordered with a 'B&O Play' audio system upgrade. And of course, you can talk to your dealer about the sporty 'ST' version and the Fiesta 'Active' variant that offers SUV styling cues that target the growing Crossover market. I'd want to allow a bit extra for the clever options though, an example being the neat openable panoramic glass roof. There's sophisticated safety too, including a Pedestrian Detection system that can even prevent collisions at night. And 'Active Park Assist' with brake interventions to prevent low-speed collisions when parking hands-free. As for standard equipment, even base models get features like air conditioning, Bluetooth, an 'Emergency Assistance' system and a 6-speaker stereo. The latest version of this Ford Fiesta is a thoroughly impressive car with very few discernable flaws. Ford has elevated its supermini stalwart to a level where it's a prime target for rival manufacturers developing their own new products. Good luck to them in trying to beat this one.